Whether you own a shop, work in a production facility, or do work at home — you can't work comfortably in a noisy environment for very long. If you run a business, you definitely don't want your customers exposed to a loud compressor and higher noise levels could jeopardize the safety of workers. In this article, we'll decode loudness and show you what to look for when shopping for a quiet air compressor. Why Are Compressors So Loud? Noise levels of air compressors today range on average between 40 and 92 decibels, which is quite a large gap. How can one air compressor be about half as loud as a conversation, and another one be downright deafening? It has to do with a couple of different factors. Some methods of compressing air such as reciprocating compressors have more moving parts that make contact with one another and cause a great deal of friction. Others like scroll and rotary screw compressors, have as little as one moving part in the entire machine and is by design, nearly silent. Friction also plays a crucial role depending on the size and capacity of the machine. Almost all inflators are extremely noisy because they have zero capacity and are very compact. For example, in order to get the amount of pressure it takes to fill a truck tire, the tiny piston inside that inflator has to move like crazy (high RPM) and therefore generates a lot of noise and heat in the process. Generally, you'll find that quieter, higher quality air compressors tend to be more expensive than their less expensive counterparts. Another factor that plays a part in the decibel output is the compressor's source of power. Quieter compressors are without a doubt electric-powered, whereas gas-powered compressors will inevitably produce more noise because they basically employ an engine to produce the power to compress the air. The closer you are to the air compressor, the louder it is going to be and there may be situations where a noisy compressor is unacceptable like a dental office. If you want to eliminate noise exposure altogether, one of the best alternatives is to just relocate the compressor further away from your workspace. If you have the room, compressed air piping systems are perfect for relocating the compressor and allows flexibility to fit every need. 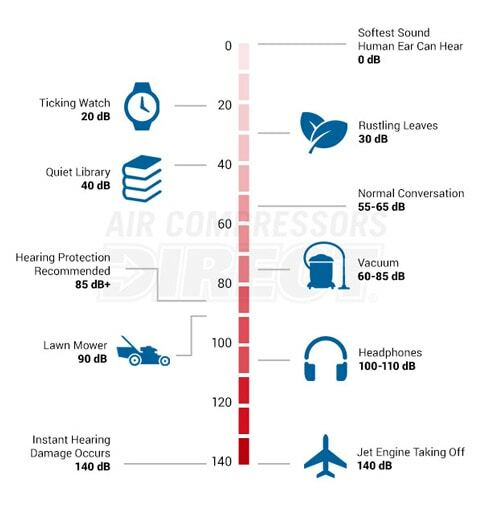 While sourcing your next air compressor, it’s good to know the sound levels that require hearing protection as well as noise levels that can cause immediate and permanent hearing loss. This is called noise-induced hearing loss or NIHL. Many users do not realize that even being exposed to noise levels around 80 decibels, like a loud vacuum, for extended periods of time can also result in hearing loss over time. This is especially important for jobs where the worker is close to the air compressor or machinery where decibels may be higher than at greater distances. Look at the pump on most compressors and you'll notice it's totally exposed resulting in an unrestricted blast of noise to your ears. 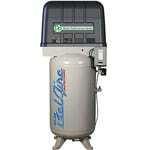 Many consumer and professional-grade air compressors are now being manufactured using thicker gauge steel or aluminum with some companies using a sound-dampening enclosure installed right over the motor, pump, and fan like this two-stage compressor from BelAire. Quiet compressors also utilize strategically placed dampening pads to reduce the amount of vibration and contain the sound waves produced by the compressor. Vibrations that are emitted from the compressor may actually have an amplifying effect and cause the compressor to become louder than it actually is. 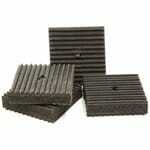 To help solve this, rubber isolation pads are great for keeping vibrations from reaching the floor. By implementing rubber pads and with other sound-dampening techniques, air compressors can now be made to produce less than 70 decibels of sound. That's slightly more than a common 1-on-1 conversation, which is pretty easy on the ears. That's a great improvement from 90 dB, which would be enough to permanently damage your hearing. It makes sense that if a compressor doesn't have any oil in it, then it must be loud. In fact, we hear this all the time, "I don't want an oil-free compressor because they're too noisy!" Well, that may be true at least for entry-level reciprocating air compressors but contrary to popular belief, there are air compressors that are very quiet AND oil-free. 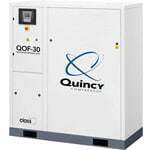 More and more manufacturers are developing new technologies for the medical, dental, and food industries that require clean, quiet, and oil-free air compressors. Examples of these compressors are a rotary screw, scroll, or reciprocating pump that features a dual-piston design. Learn: Is an Oil-Free Compressor Really Better? It's true that electric-powered air compressors are quieter than ones that run on gas, but that still leaves a huge number of compressors from which to choose. So, the next step is determining the type that fits your needs. By far the most common compressor type is a reciprocating piston pump. These are straightforward pumps that use the same piston you would see in an engine that rotates in a chamber to compress air. They move up and down rapidly to capture air that is in proportion to the size of the piston itself. Single-piston models tend to be noisier than dual-piston (also called duplex) reciprocating air compressors. 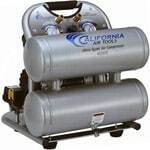 Duplex compressors, like ones from California Air Tools, produce less noise, because they produce more air with fewer revolutions, have tighter tolerances, and allow for better cooling. 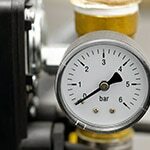 Other features to look for in low-noise reciprocating air compressors include: low RPM, ASME certified tanks, cast iron cylinders, and compressors that come equipped with an aftercooler. Rotary screw air compressors are much quieter than reciprocating compressors. They feature a positive displacement compression system that includes a pair of matching helical screws. It's similar (in design) to a turbocharger that sticks out of the hood of a hot-rod. Oil-injected types are more common and less-expensive than oil-free models. Although oil-free compressors are more expensive up-front and costlier to maintain, they are far superior in quality and are required in the medical and food industries. What makes rotary screw compressors so quiet is the fact that the helical screws don't actually touch one another. A huge benefit of rotary screw compressors is that they can be mounted close to workspaces without requiring hearing protection. For instance, Atlas Copco's VSD+ line of air compressors are so quiet they only produce 62 decibels! 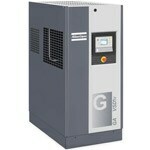 The most exceptionally-quiet and efficient of all air compressors is the scroll air compressor. Scroll air compressors use two spiral-shaped metal pieces to compress the air. One piece is stationary while the other fits inside and moves in a circular motion creating the compression. Scroll compressors are made to run continuously and are ideal for many commercial applications like medical, pharmaceutical, food, laboratory, textile, electronics, and production facilities. 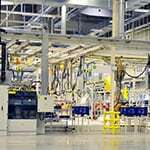 Although they are designed to run continuously all day long, their only drawback is their limited CFM capacity. Anywhere unlimited, quiet and clean air is required, a heavy-duty scroll compressor is the way to go.